The Concert Breeze wireless speaker light kits are designed to simplify your sound system no matter the room. Any previously installed ceiling fan that accepts a standard three-screw light kit can now also be your audio solution. The kits can also be installed anywhere there is access to a standard 120V power line, making them great as standalone semi flush lights. The Concert Breeze light kits utilize the same proprietary 2.4GHz wireless audio system found in other Soundolier products. Without the hassle and expense of running wires, the light kit's built-in speaker receives full range digital quality audio from any source, up to an impressive 300 feet away. Simply connect a Soundolier Maestro wireless transmitter at any audio source – TV, mp3 player, etc. – through speaker level or 3.5mm input jack and send stereo summed DSP audio to the Concert Breeze. Four selectable stereo signal channels virtually eliminate interference and one transmitter can send the signal to an unlimited number of receiver devices within the signal range. The Concert Breeze Light Kits are available in three style options: snow white with swirled marble glass (model #CSLK-11), brushed nickel with swirled marble glass (model #CSLK-45), and oil rubbed bronze with amber scavo glass (model #CSLK-73). Both the snow white and bronze models are damp rated for indoor or outdoor use. The Concert Breeze utilizes a proprietary 2.4GHz wireless audio system. Without the hassle and expense of running wires, the Concert Breeze receives full range digital quality audio from any source, up to an impressive 300 feet away. Simply connect a Soundolier Maestro wireless transmitter at any audio source – TV, mp3 player, etc. – through speaker level or 3.5mm input jack and send stereo summed DSP audio to the Concert Breeze. Four selectable stereo signal channels virtually eliminate interference and one transmitter can send the signal to an unlimited number of receiver devices within the signal range. 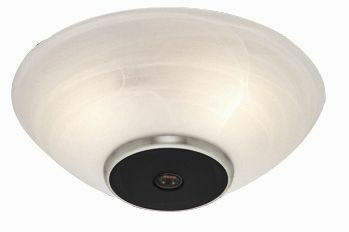 The Casablanca Light Kits with integrated Soundolier wireless speaker system can be mounted to any ceiling fan that accepts standard three screw light kits or can be used as a semi-flush lighting solution with a two-gang junction box. Indoor and Outdoor damp rated models are available.